This week, we've been playing with the Barbie Dance & Spin Ballerina Doll, sh'es so pretty. 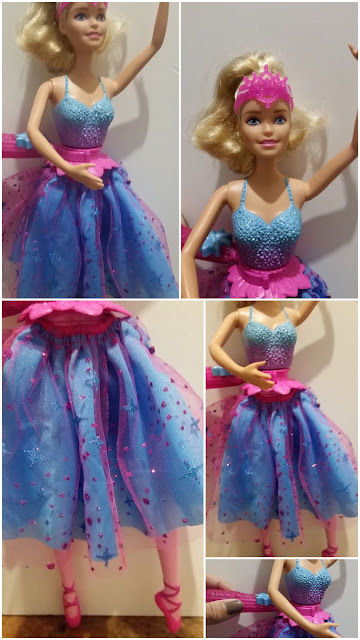 We love her sparkling blue and pink dress, it's got a lovely layer of blue and then a sheer pink overlay with blue glittery sparkles which really completes the Ballerina look. My little Barbie fan Lily (aged 8) has always wanted to be a Ballerina so she was very excited when she saw this doll. Lily loves pink and anything that sparkles so again, this doll was a huge hit. It was really nice to see a Barbie doll without the totally 'over the top' usual glamorous hair. This doll is pretty yet very simple with her hair done in a classic pony tail just like my girls have in their hair every day. Lily was delighted. 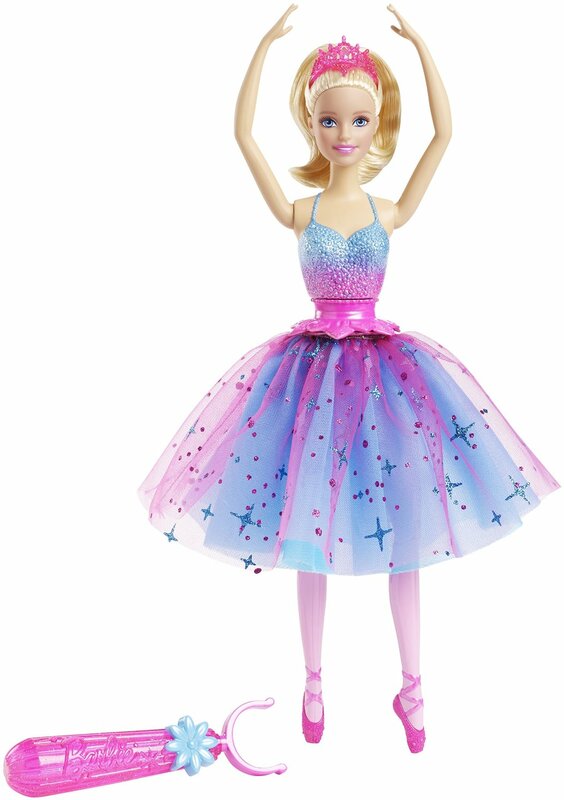 With this Barbie Dance & Spin Ballerina Doll you can dance the day away as she's a twirling ballerina doll that brings performance and possibilities to life! You control the choreography by choosing when your beautiful prima ballerina spins. She's simple and magical, and it's great that the mechanism is really easy to work. You simply clip the pink wand, adorned to the waist of the doll, and press down. Your Barbie doll will then bend into a classic plié, and her body begins to spins gracefully, causing her foot to rise and her skirt to float and flow. She's aimed at children aged 3 and over and costs around £19.99. 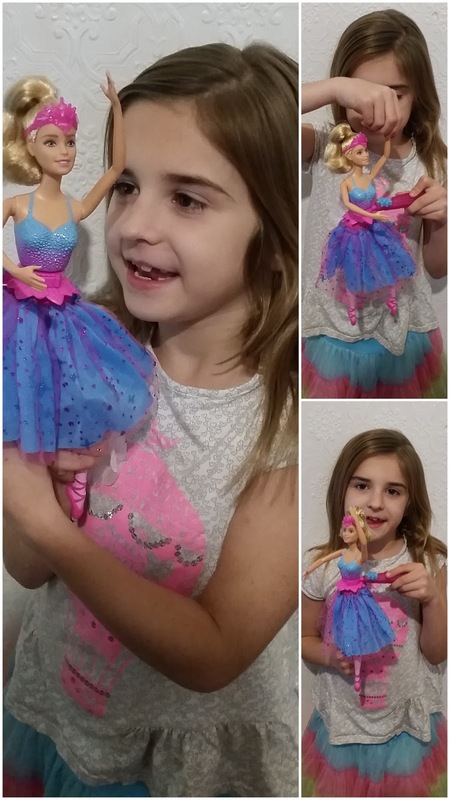 Lily loves her Barbie Dance & Spin Ballerina Doll. She really likes her sparkling dress and loves the little ballet shoes that she's wearing. There's one thing that Lily doesn't like and that's the fact that the right leg doesn't go down to a normal standing position for when she doesn't want to make her doll dance. Overall though, we really liked this doll and loved the fact that the doll can twirl, spin and dance all day long with no batteries required. Lily has now happily added her new Ballerina friend to her ever growing Barbie collection. Disclosure: We received our doll in return for an honest review. All the opinions expressed within this review are 100% honest and entirely my own.